The octopus is one of the most well-recognized animals in the sea, but what about their lesser-known cousins? Squid and cuttlefish may not get as many Hollywood roles as their eight-armed relatives, but they’re equally as interesting. Take a minute to explore these tentacled invertebrates—and learn how to tell them apart. Let’s start with what they have in common. Both squid and cuttlefish are part of class Cephalopoda, which is a type of mollusk that also includes octopus and nautilus. Unlike other mollusks, like clams and snails, most cephalopods have lost their hard outer shells. Cephalopods get their name from the Greek word meaning “head-feet”, because their arms encircle their heads. 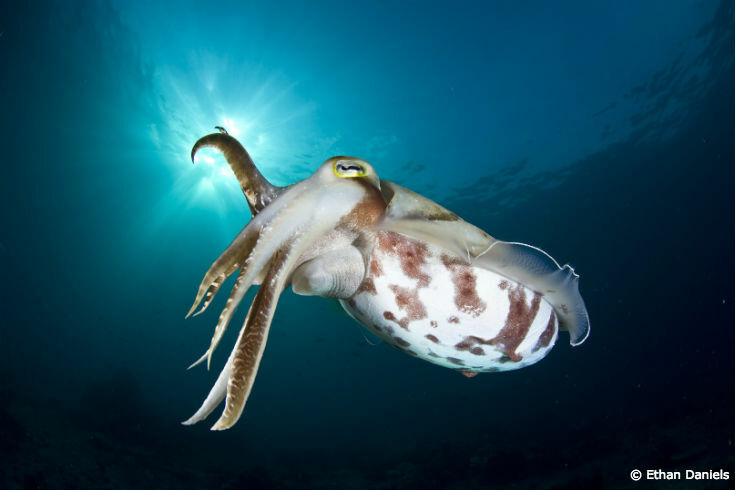 Both squid and cuttlefish are known as ten-armed cephalopods because they have eight short arms and two long tentacles (as opposed to eight-armed cephalopods like octopuses). Here’s where they start to differ: cuttlefish are in order Sepiida, which includes species like the common cuttlefish, flamboyant cuttlefish and striped pajama squid. Squid, on the other hand, are part of order Teuthida, which includes the Caribbean reef squid, short-finned squid and giant squid. Fun fact: The mysterious vampire squid has an order of its own! They’re part of order Vampyromorphida, which is comprised of only one living species. So how can you tell these captivating cephalopods apart? Both squid and cuttlefish have remnants of their ancient external shells, but these hard structures look quite different. Squid have a flexible, feather-shaped structure inside their bodies called the pen, where cuttlefish have a broader internal shell called the cuttlebone. The cuttlebone is porous and helps the cuttlefish stay buoyant underwater. If you don’t want to dissect an unknown cephalopod to check its internal shell, just watch it move underwater. 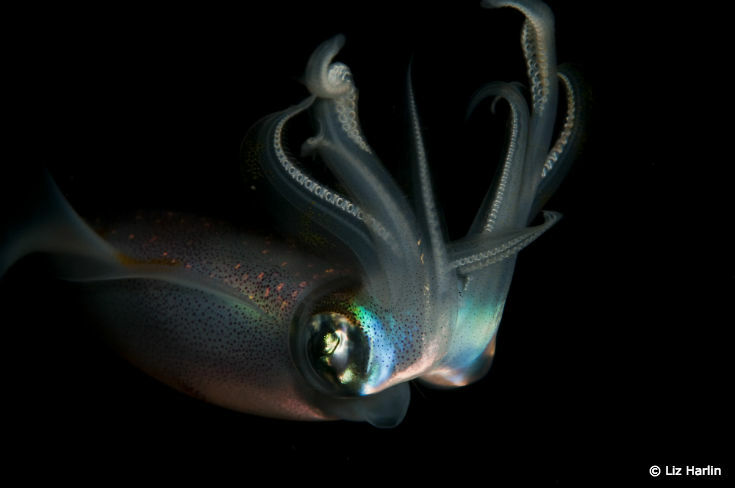 Squid are fast-moving predators, where cuttlefish are slower and move by undulating long fins on the sides of their bodies. You can also gaze into their eyes to tell them apart: squid have round pupils, where cuttlefish pupils are W-shaped. And perhaps the easiest indicator of all? Squid have sleek, torpedo-shaped bodies, compared to the broader, stout body of the cuttlefish. There you have it! Despite their similarities, squid and cuttlefish are equally distinctive members of the cephalopod class. Now, go out and impress your friends with your extensive knowledge of these quirky and intriguing invertebrates!